Once spring hits, recipes that can be prepped in under 10 minutes and ready and waiting when we come home at the end of the day are our specialty! Juggling 3 travel soccer schedules with regular school activities and commitments make for a very, very busy spring. Having easy yet tasty meals is crucial to making sure everyone is fed and well fueled before homework and training sessions every evening. I usually double every recipe as my two teens have a second late evening meal as well. 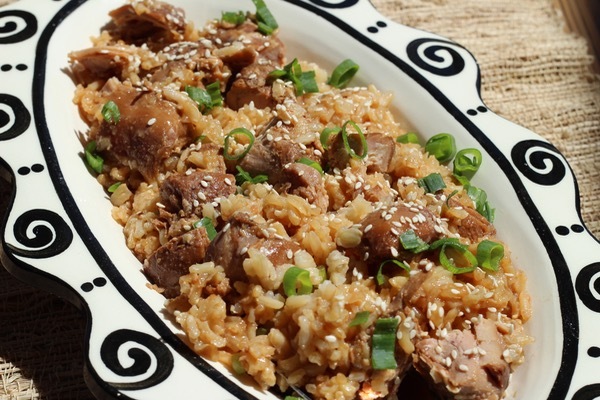 This is a comforting, flavorful and versatile recipe and if you cook your rice in advance and reheat or use my favorite frozen organic brown rice from Trader Joe’s, this recipe is certainly a breeze to make. Broccoli on the side and voila, your meal is complete. You can even toss in broccoli florets during the last bit of cooking for a well rounded dish. Depending on your preferences, you can play around with the flavors a little too. Use more ginger for extra kick, add extra honey if you like things sweeter, or add a few dashes of Sriracha for some additional spice. 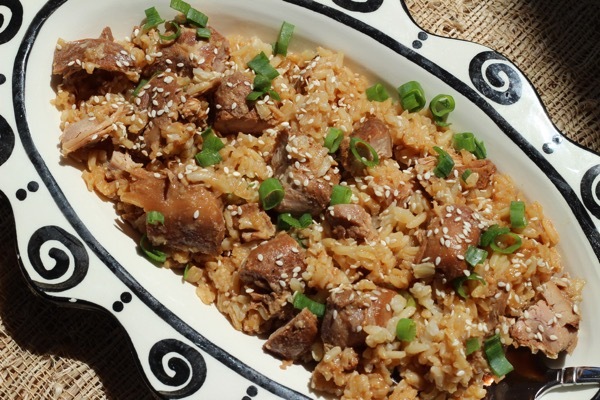 My original recipe used the cornstarch and water mixture and while I used to do that step, I no longer do and the sauce is perfectly fine and the kids prefer it a little more saucy to soak up into their rice. Also, I did not insert a “What Makes This Recipe Healthy” section as the biggest factor that makes this recipe healthy for us is using real food for a great weeknight meal when the temptation is to have something prepackaged or to grab fast-food. 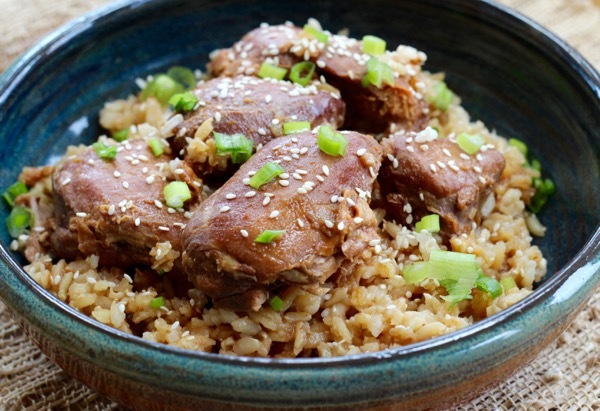 Place the chicken thighs on the bottom of your slow cooker. Whisk sauce ingredients together in a medium bowl (Chili sauce through pepper) and pour over the chicken. Cook on a low setting for 3-4 hours or on high for 2 hours. Remove the chicken to a cutting board and if desired, mix the cornstarch with the water and add to the sauce in the crockpot, stirring well to combine and heat on high for a last 5 minutes testing the sauce to adjust for seasonings. Cut the chicken into bite size pieces or shred or even leave whole and toss back into the slow cooker with the sauce. 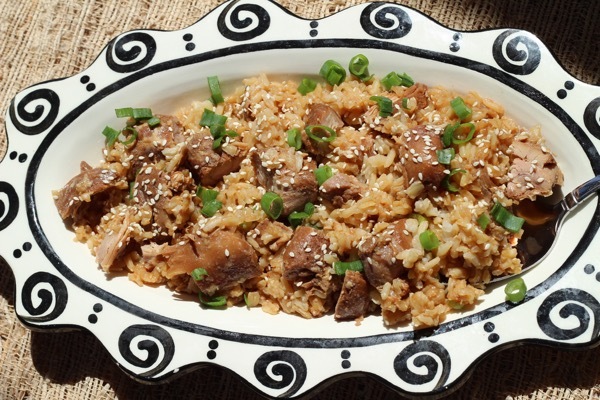 Serve hot over a scoop of brown rice and garnish with sesame seeds and green onions.